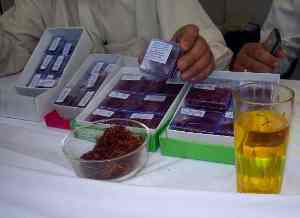 Saffron cultivation in India is mainly done in the states of Himachal Pradesh and Jammu and Kashmir. Harvesting is the most difficult part in Saffron farming. Saffron plant needs extreme heat and dryness in summer and extreme cold during winter. Discover how to grow Saffron. Kesar or zafran- the costliest spice in the whole world is an interesting plant since it can grow almost anywhere. Being the most expensive spice in the world it is nicknamed as ‘Red Gold’. Saffron in India mainly cultivated in Himachal Pradesh and Jammu and Kashmir. However, it can grow in almost anywhere in the world. It is a costly spice owing to the fact that it is extremely difficult to harvest the crop. Saffron is believed to have originated from Greece with wild saffron as being the parent variety. Wild saffron is botanically called Crocus cartwrightianus and its domesticated variety is the commercial saffron. The commercially cultivated saffron is botanically named Crocus sativus. It can grow upto 20 cm in height and is a bulbous perennial plant with globular corms. It is the corm that is planted for saffron cultivation. The saffron or kesar flowers vary in color from lilac to purple. The style is yellow in color while the stigmata are bright red. Kesar flowers are divided into 3 branches. The red colored stigma of the flowers are harvested and used for spice purposes. The most popular use of saffron in India is as a flavoring and coloring agent in milk and milk sweets. Apart from this it is used as a seasoning agent in cheese, mayonnaise, meat, etc. They are popular as a flavoring and seasoning agent in the Mughlai cuisine. It is used for healing arthritis, infertility, liver enlargement and fever in Ayurveda. Saffron can grow almost anywhere. For commercial saffron production the primary requirement is fertile soil. Climate is the next big factor. It needs a good photoperiod and a dry soil with light moisture. Optimal climate for growing saffron is warm, sub-tropical climate. Saffron grows well at an altitude of 2000 meters above sea level. It needs a photoperiod of 12 hours. In other words, it needs 12 hours of sunlight for good growth. In India, saffron corms are cultivated during the months of June and July. At some places it is also cultivated in August and September. Saffron plant starts flowering in October. Saffron needs extreme heat and dryness in summer and extreme cold during winter. Maximum vegetative growth takes place during winter. Such weather is prevalent in parts of Karnataka, Himachal Pradesh and Jammu and Kashmir. Soil is one of the primary requirements in saffron cultivation. It can grow in loamy, sandy or calcareous soil. Gravelly soil is also favorable for saffron farming. It is not necessary to have a good moisture retaining capacity in the soil as saffron needs a medium amount of moisture during growth and extreme dryness in summer. However, a heavy, clayey soil is not suitable for saffron farming. Saffron prefers acidic soil. It grows well when the soil pH is around 5.5 to 8.5. Saffron crop requires little water. The soil must not be completely dry but just moist. Unlike a lot of other crops it does not need a very wet soil. The soil must be lightly moist for optimal growth. In case of erratic rains, sprinkler irrigation is the most commonly followed practice. About 283 m3 per acre of water must be distributed throughout the period of saffron cultivation. Irrigation is done on weekly basis. The agricultural Directorate of Jammu and Kashmir recommend weekly irrigation for ten weeks among which the first seven is the most crucial period. This is because it promotes vegetative growth and facilitates flowering. Pre-flowering irrigation must be done in the last week of August and continued upto mid-October. The last three irrigations are done in November to promote vegetative growth of kesar plant. Research has shown that repeated saffron cultivation on the same field makes the soil ‘sick’. In other words, the fertility gets affected. Sowing beans has been found effective in increasing the crop yield of saffron and also increase the corm size. It is advisable to not cultivate saffron for 8-10 years after one round of saffron farming. Saffron cultivation is done through corms that are underground, compressed stems. There are three different varieties of saffron cultivated in India, especially in Kashmir. Cultivated in Italy at Navelli Valley and Sardinia, it is an Iranian variety. The plants of this variety are shorter and so is the thread length. The color is slightly less red than Kashmiri saffron. However, it is the most abundantly available variety of saffron in the market since it is produced in bulk and is less costly than Kashmiri variety. This variety is used in US and other countries and is of lower quality as compared to Kashmiri or Iranian variety. The floral waste is higher in this variety and has a lot of yellow parts of the style. Needless to say it is the cheapest of all varieties of saffron available in the market. Cultivated only in the Kashmiri soil, this variety is the most popular of all. It ranks number one in the world in terms of quality. The strands are dark crimson red. They are exclusive to the Kashmiri soil. The flavor, aroma and color that it imparts make it special worldwide. This type of saffron is difficult to find outside the Indian borders. 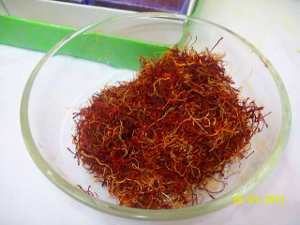 In addition, it is the most expensive type of saffron available in the market. The land for saffron cultivation must be ploughed two to three times. It should be free of previous crop debris, stones, rocks and soil clods. Repeated ploughing helps the soil loosen, the subsoil come up to the surface and fertility also increases. Farm yard manure and organic content are also mixed with the soil before cultivation. Saffron can be cultivated in both beds as well as in pits. Pits are dug that maybe 12-15 cm deep with an inter-plant distance of 10 cm. The corms for saffron cultivation are planted directly into the previously dug pits. The surface is then covered loosely with soil. Compact packing may restrict air circulation. Normally, irrigation is not required after sowing the corms. However, if there has been a long dry spell or prolonged drought with hot season then irrigation maybe needed. It also depends on the presence of moisture in the soil. Weeds like saffron thistle compete with the crop for nutrition and sunlight. It is a prickly, hardy and stocky plant with sharp spines that cause injury. The most common method of weed control is mulching the plants with saw dust. Weedicides are also used in some places. The major diseases affecting saffron crop are fusarium wilt, violet root rot and Rhizoctonia crocorum. Porcupines, rabbit and rodents are other pests that can spell damage on saffron crop. Harvesting process in saffron is laborious and time consuming. In fact, it is the harvest process that makes saffron a costly spice. Saffron plants start flowering within three to four months of planting. Therefore, if planted in June, ideally they would start flowering by October. Specialty of saffron is that the flowers are the commercially used part. Flowers bloom at dawn and wilt as the day progresses. Therefore, harvesting of flowers must be done at dawn. It is said that the flowers must be plucked between sunrise and 10 AM. The flowers are then piled to remove the stigma which is the orange to red colored part. The stigma strands are dried under the sun for five days and then packed in air-tight containers. In case of solar driers, it needs 7-8 hours of drying. Is it possible to cultivate saffron in Ahmednagar district of Maharshtra state with controlled and closed environment? Possibility and profitability are two different things. Even if you are able to produce saffron in Maharashtra in polyhouse the quality will not be good and the cost of production will be higher compared to natural weather. Hence this will not be a viable business model. Please talk with our expert if you need professional consultancy service. Can we try cultivating saffron in eastern UP, nearby Gorakhpur, for commercial purpose? Saffron is not a suitable crop for Uttar Pradesh climate. Though there are very few example of people trying saffron farming in Uttar Pradesh but the quality of produced saffron is not the same as Kashmir. You’ll also face marketing problem. If you need agriculture consultancy service in Uttar Pradesh, please talk with our expert. Hello sir I wanted to ask that can I grow saffron in Andhra Pradesh, is this good idea and the soil, climate would be suitable for crop or not ? I am interested to grow saffron in Ludhiana, punjab. Please guide me, if possible. If you want professional consultancy service then contact us. Are there any chances for growing saffron in Gujarat?? I’m from Karnataka. Which parts of Karnataka are good to grow saffron? Is it possible to grow saffron in middle zone of India by hydroponic method? Can it be profitable or not? Do you want to grow saffron commercially? I am from lower Himachal District Bilaspur. I am highly interested to grow saffron. Is there least chance to grow saffron in Lower Himachal? What’s the minimum and maximum temperature throughout the year in your area? Is it possible to grow saffron hydroponically to whom shall I contract primary consultancy purpose? If you want to buy professional consultancy service then talk with our expert. Dear Sir, I go through the content. I could not find the address or contact number of saffron bulb supplier. Please get me the address and the price of bulb. What quantity of saffron bulbs you require? Hi, I just wanted to know if it is possible to grow saffron in Sikkim.